If you have been using Dlvr.it, you would definitely be aware of the pretty good automation features offered by the software. The social media automation is something that has been a critical necessity these days. In order to have the perks of brand exposure, extended outreach, and increased sales, you need a software that gets social media chores done on your behalf. Therefore, Dlvr.it is one of such automation tools designed to automate the social media activities. With an easy to navigate dashboard and explicit features, Dlvir.it free or pro is an uncomplicated software to automate and curate the social media content. My dlvr.it journey lucidly states that social media marketers are in pursuit of excellence. A marketing automation tool that offers more in terms of features, pricing, and convenience is obviously the most preferred one. And this excellence hunting compelled me to look for a better and advanced dlvr.it alternative. 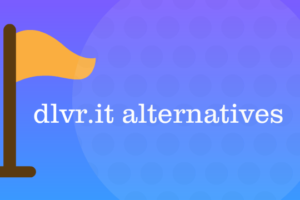 Dlvr.it Review – What does it offer and what are missing? Dlvr.it has an explicit ‘Automate’ option on its dashboard. 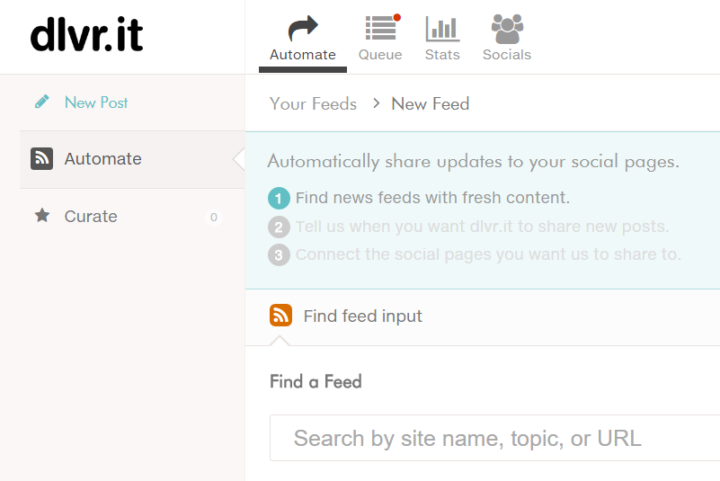 This feature allows a user to find the fresh content from the RSS feeds enabled websites. Setting up a schedule of the post, you can share it to connected social pages. But the software does not offer enhanced content management system in a sense, that curation is not enough intelligent. You cannot look for the latest viral posts and trending content on the internet. You can share a post immediately or queue it up to share later. Both Dlvr.it free and paid plan enables you to set a schedule for your posts. But the queue is not enough comprehensive and does not let you determine the right time to publish your post. Although, you can monitor the statistics of user engagement in both dlvr.it free and paid versions. You can integrate Google Analytics or any other web analytics service with your dlvr.it account. But it just tells you the insights like clicks, users, and followers with graphical representation. The software does not offer any marketing or promotional tactics . Although, you can have a secure content curation and distribution with dlvr.it. But it does not let you enjoy an increased outreach and lead generation. The software has two plans – Basic and Pro. But what really sounds restrictive is too limited features with Basic Plan. Although, the basic plan is free but allows you to share to only 3 social networks from up to 5 feeds or sites. You will have to pay to promote your stories. 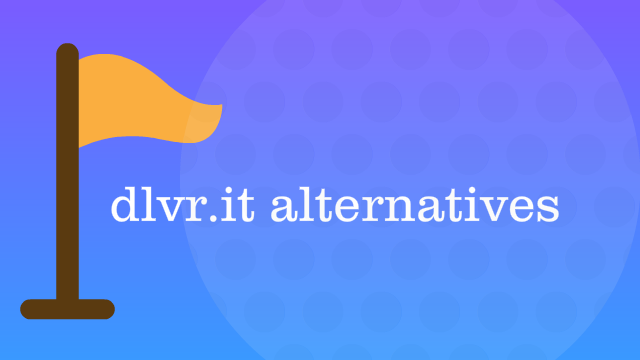 Dlvr.it enables users to automatically post content from RSS-enabled websites to their desired social networks. But on a factual basis, the software is serving with scant features, because social media automation is not merely about curating and distributing content. And this is where it becomes necessary to look for a better Dlvr.it alternative. And finally, I discovered the software that is my real savior in social media automation. Fan Page Robot paid off my hard efforts with its tremendous features and great customer support. This is not only an automation tool, rather a complete marketing suite that has everything to facilitate your marketing needs and will definitely become my dlvr.it alternative. What I have really found exciting that differentiates it more from dlvr.it free and paid versions, I have listed below the features. One of the foremost features of Fan Page Robot is the easy to go nature. With many features and useful options, the software does not have any kind of complicated dashboard or control panel. Everything is just as easy as clicking the option and gets the job done. A worthwhile point is that their support staff are very responsive. They usually respond to my questions and requests in an hour, sometimes just in a few minutes. Whatever the price plan of Fan Page Robot you are subscribed with, the software offers all-in-one social network integration in every plan. You can automate your social activities on Facebook, Instagram, Twitter, LinkedIn, Google+, Pinterest, Tumblr, Blogger and Wordpress. It allows you to auto post to Instagram without a phone, which is a great feature missing from dlvr.It and other social media marketing software. Pro Plan – This plan enables you to manage up to 3 Facebook pages and 32 other social media pages, just at an unbeatable lower rate of $9/month. Unlimited Plan – As the name implies, the plan enables you to manage unlimited pages on 9 blog or social media platforms along with “Priority Customer Support” service. And all this can be acquired just at the rate of $29/month. Unlike dlvr.it and many of the social media automation tools, Fan Page Robot does not charge anything as hidden or extra charges. What all you have to pay is just the monthly fee, hence you can enjoy all the features and marketing advantages in that payment. The software has the best content curation and management system I’ve ever seen. Using the Content Generator tool, you can retrieve the most trending stuff as per your target keywords. Just enter the keywords (according to your niche) and find the exciting videos, gifs, infographics, photos, memes, news articles, and a lot more. In a single click, you can share the curated content on different social or blogging platforms. The content curation and automated sharing have not been that much easy before. So, this feature makes it more powerful to become a dlvr.it alternative. The software has another exciting feature that makes it a smart dlvr.it alternative. That is you can easily overcome the deficiencies of your social media strategy. The software has an exciting feature that lets you discover the top influencers (and competitors) of your target industry. Just enter the target keywords in Content Generator tool and hit the “Influencers” button, you will come across with a list of top influencers from Twitter as well as the top relevant Facebook pages. Researching through their campaigns would help you out in reshaping your strategies accordingly. The right time matters a lot when it comes to social sharing. You can make a big difference with social sharing if it is shared at the time when most of your target audience is live. With easy drag and drop technology, you can manage your posts in the calendar and set an appropriate time of publishing. The scheduler automatically determines the best time for your post so it can be discovered widely. While performing social sharing, how one can forget hashtags. FPR provides you with the best hashtags for your post. 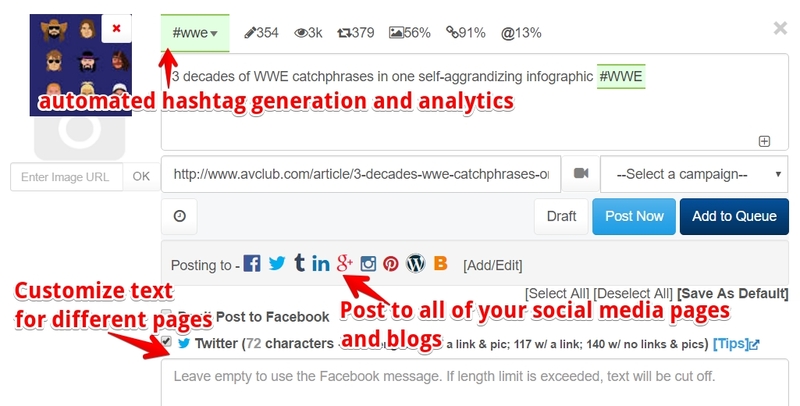 You can find out the hashtags as per your target niche alongside the detailed statistics. The software fetches information for each hashtag like an average number of views, shares and favorites on Facebook and Twitter. Selecting the right hashtag for your post will help you acquiring more likes, shares, and followers. It also lets you promote your products/services on high-authority websites without any extra marketing cost. The software has an easy to operate yet powerful WYSIWYG editor that lets you design your customized lead pages. You don’t need any technical skills to use this feature. Just drag and drop the required tools, and you will have a stunning lead generating form. This marketing tactic lets you grow your fan base, email list, website traffic and sales. You can enjoy an increased user engagement with automated video marketing to Facebook. Since videos have much higher engagement rate than any other content type, the software allows you to share videos within no time. You can fetch videos from any of the social media or other sites and automatically upload to Facebook with the highest quality standards. Now Facebook promotion is no more an issue. FPR enables you to promote products/services on Facebook for free without any penalties. The campaign builder helps in marketing while preventing you from getting overly promotional. The Content Generator tool lets you curate and share exciting stuff with users in a normal manner. As the user clicks on the link, he/she will be directed to the website having the view of your lead generating form as well. Dlvr.it is an easy to operate software with quite handy features for automatic content curation and distribution. But with more advanced features and flexibility in a highly competitive price, Fan Page Robot comes up as an impressive dlvr.it alternative to manage your social media chores, increase your followers and bring more website traffic.